Let me take you on a whirlwind tour of Cork and some of the fine eating & drinking I enjoyed there recently. As well as all the treats listed below, we also visited the Fish Wife chipper on MacCurtain Street and Market Lane restaurant on Oliver Plunkett Street. Separate blog posts will follow for those locations. After checking in at the Gresham Metropole hotel on MacCurtain Street, we headed out for some drinks. 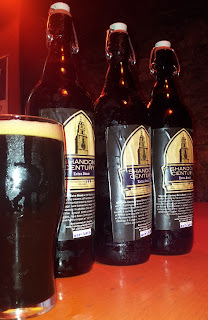 We wanted to enjoy some craft beers, so we headed to the Bierhaus on Pope's Quay. As well as serving a great selection of beers, it's also possible to enjoy a pizza at your table, courtesy of neighbouring pizzeria Uncle Pete's. On a previous visit, the smell of warm fresh pizza and basil had permeated the bar, leaving me salivating. On this visit, I was able to resist until the walk home, when I conceded defeat to a slice of margherita pizza for a mere €2. 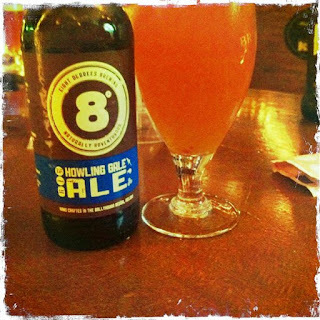 I must give a shout out to the great Mitchelstown-based Eight Degrees Brewing. I've become quite partial to their beers, particularly the Sunburnt Irish Red. Unfortunately, it wasn't available in the Bierhaus that night, but I quite happily made do with the Howling Gale Ale. The problem with beers is that they tend to have an impact the next day, which often takes the form of a craving for fried food. 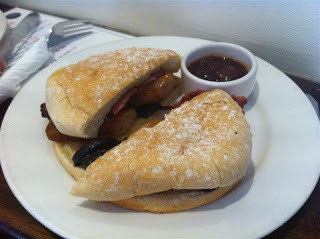 Thus it was that we found ourselves enjoying a breakfast bap in Idaho Cafe, tucked away behind Brown Thomas on Caroline Street. This small location, which can be a tight squeeze at times, offers coffee, pastries, cakes and light food throughout the day. It's a very nice spot to stop and relax while in town. Later in the day, I needed more coffee, so I called into O'Conaill's chocolate shop on French Church Street. 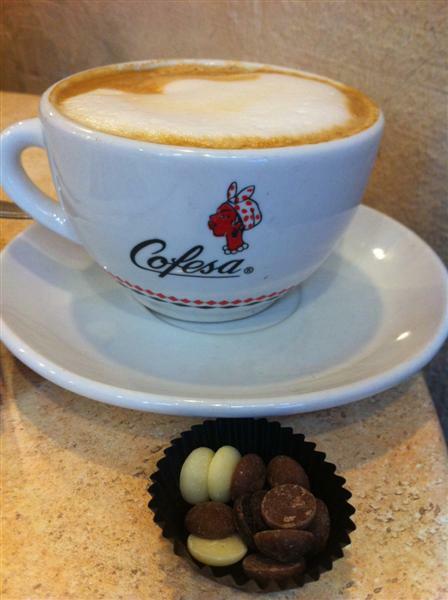 Although the interior has changed since I last visited (and not in a way that I like), the coffee is still good and a little paper cups of chocolate chips (milk, dark and white) bought some sweetness to my afternoon. These tasty chocolate chips can be purchased as part of a hot chocolate making kit for your enjoyment at home. I made one final stop on my walking tour of Cork by calling to Bradley's of North Main Street. My grandmother used to call regularly to this great value grocery, but given that she was a Pioneer, I don't think she had much interest in their range of wines and beers. The back of this shop is a true shrine to the brewer's art. Many craft beers are on offer in a 4 for €10 deal but they also stock some Cork treasures including the delectable Stonewell cider from Nohoval and the limited edition series of beers from the Francisan Well Brewery on the North Mall. I opened the bottle of Stonewell cider as soon as I got back to Dublin. When I was finished, my only regret was that I hadn't bought more bottles. It features a mix of 3 different types of cider apple juice which is blended with fresh juice at the time of bottling. Right now, it's only available in Munster due to limited quanities, but I've been promised that much more will be available in 2012. 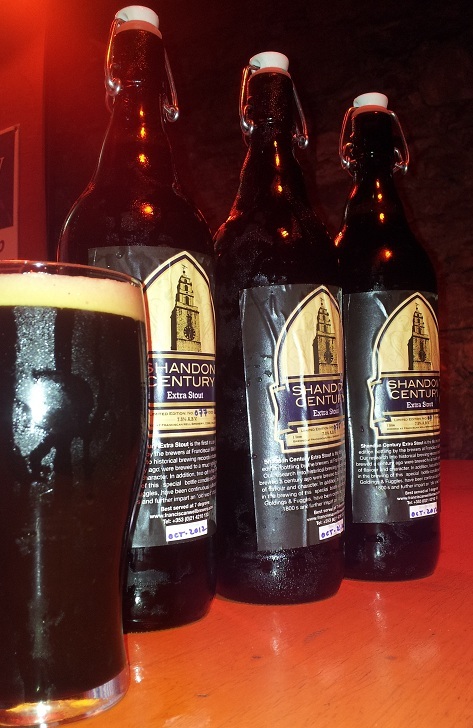 Himself and his brother cracked open the numbered special edition bottle of Shandon Century Extra Stout. It's pretty strong for a stout at 7.5%, but was easy drinking with a lovely caramel flavour and dark malts. I've heard from the knowledgeable Michael (of Bradley's fame) that the stout is now all sold out, but he has also reassure ment that there will be more special edition beers from the Well. The Bierhaus, Pope's Quay, Cork. Uncle Pete's, 31 Pope's Quay, Cork. O'Conaill's Chocolate Shop, French Church Street, Cork. Franciscan Well Brewery, North Mall, Cork.